In the United States, Lyme disease is mostly localized to states in the northeastern, mid-Atlantic, and upper north-central regions, and to several counties in Northwestern California. In 1999, 16,273 cases of Lyme disease were reported to the Centers for Disease Control and Prevention (CDC). Ninety-two percent of these were from the states of Connecticut, Rhode Island, New York, Pennsylvania, Delaware, New Jersey, Maryland, Massachusetts, and Wisconsin. Following are frequently asked questions about Lyme disease: Question: How do people get Lyme disease? Question: What is the basic transmission cycle? Answer: Immature ticks become infected by feeding on small rodents, such as the white-footed mouse, and other mammals that are infected with the bacterium Borrelia burgdorferi. In later stages, these ticks then transmit the Lyme disease bacterium to humans and other mammals during the feeding process. Lyme disease bacteria are maintained in the blood systems and tissues of small rodents. Question: Could you get Lyme disease from another person? Answer: No, Lyme disease bacteria are NOT transmitted from person-to-person. For example, you cannot get infected from touching or kissing a person who has Lyme disease, or from a health care worker who has treated someone with the disease, or by sexual contact. Question: What are the signs and symptoms of Lyme disease? Answer: Within days to weeks following a tick bite, 80% of patients will have a red, slowly expanding "bull's-eye" rash (called erythema migrans), accompanied by general tiredness, fever, headache, stiff neck, muscle aches, and joint pain. If untreated, weeks to months later some patients may develop arthritis, including intermittent episodes of swelling and pain in the large joints; neurologic abnormalities, such as aseptic meningitis, facial palsy, motor and sensory nerve inflammation (radiculoneuritis) and inflammation of the brain (encephalitis); and, rarely, cardiac problems, such as atrioventricular block, acute inflammation of the tissues surrounding the heart (myopericarditis) or enlarged heart (cardiomegaly). Question: What is the incubation period for Lyme disease? 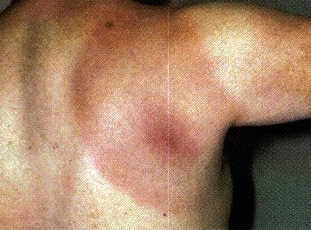 Answer: For the red "bull's-eye" rash (erythema migrans), usually 7 to 14 days following tick exposure. Some patients present with later manifestations without having had early signs of disease. Question: What is the mortality rate of Lyme disease? Answer: Lyme disease is rarely, if ever, fatal. Question: Can a person be reinfected with Lyme disease? Answer: Yes. Having had Lyme disease doesn't protect against reinfection. Some persons have had Lyme disease more than once after re-exposure to infective tick bites. This stresses the need for continued tick bite prevention activities such as wearing appropriate clothing when in tick-infested areas, daily tick checks, and quick removal of attached ticks. Question: How many cases of Lyme disease occur in the U.S.? Answer: Lyme disease is the leading cause of vector-borne infectious illness in the U.S. with about 15,000 cases reported annually, though the disease is greatly under reported. Based on reported cases, during the past ten years 90% of cases of Lyme disease occurred in ten states: Connecticut, Rhode Island, New York, Pennsylvania, Delaware, New Jersey, Maryland, Massachusetts, and Wisconsin. West Umatilla Mosquito Control District: "Diseases: Lyme Disease." Michigan Emerging Disease Issues: "Center for Disease Control and Prevention. Questions and Answers About Lyme Disease." Portions of the above information was provided with the kind permission of the Centers for Disease Control.